I know how much we all love candy. Trust me, I KNOW. I used to sit at home after trick-or-treating and stuff my face full of Hersheys, Snickers, Milky Ways, Dots, sugar, sugar, sugar, more sugar, sugar on top of sugar, and so on. Those candies are so addicting because they’re full of fat, sugar, salt, additives, and artificial ingredients that are scientifically proven to make you want to eat more. While I’ve made Healthy Homemade Snickerz here on the blog, the nougat takes a bit of time and patience to make, and sometimes, we just ain’t got no time for that. So I made these Healthy Beefcake DIY Protein Bars! 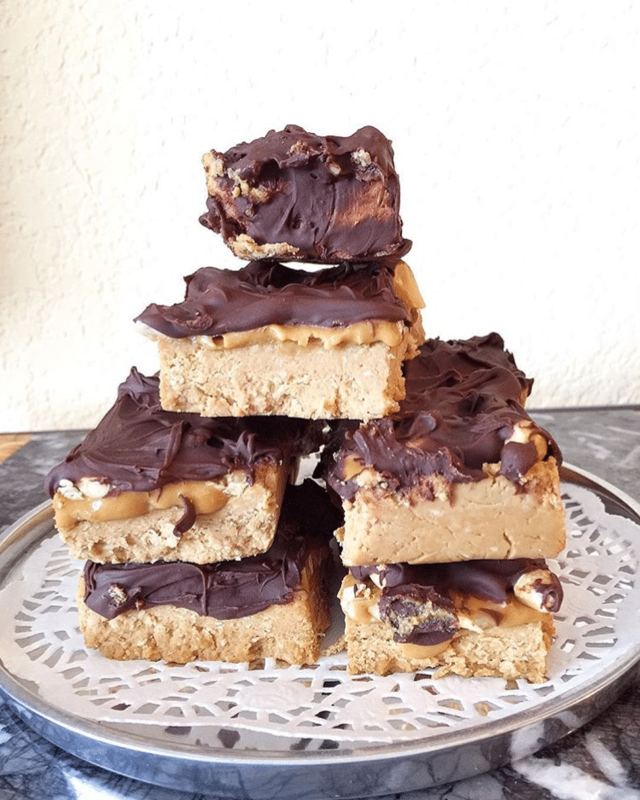 They’re basically Snickerz candy bars — they’re full of peanut butter and caramel, they’re coated in chocolate, they’re sweet and satisfying — but without the sugar, corn syrup, hydrogenated oil, and artificial flavorings. Instead, they’re filled with natural, wholesome ingredients, and a punch of protein. When you combine Snickerz Candy Bars + PROTEIN, you get these amazingly delicious Healthy Beefcake DIY Protein Bars. With a soft, chewy, peanut butter fudge base, a layer of peanut-studded caramel, and a rich, decadent, chocolatey shell, you are at a 99.99% chance of having a foodgasm. These are some treats you can sink your teeth into. Guilt free. These are pure bliss. Chewy, crunchy, sweet, salty… and secretly good for you. Every single person who has tried these DIY Protein Bars could NOT believe they were healthy. There is nothing healthy tasting about ’em. You can’t go wrong with Healthy DIY Protein Bars! 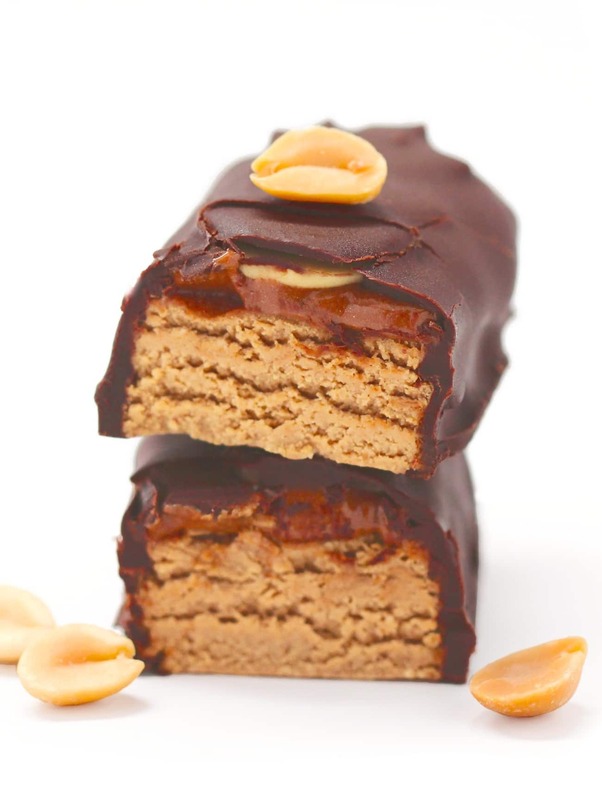 These are some simply mouthwatering candy protein bars. As you can see. When you combine Snickers with PROTEIN, you get these amazingly delicious Beefcake DIY Protein Bars! With a soft, chewy, peanut butter fudge base, a layer of peanut-studded caramel, and a rich, decadent, chocolatey shell, you are at a 99.99% chance of having a foodgasm. In a small bowl, stir together the caramel sauce and protein powder. Mixture should be thick and slightly sticky. Spoon the mixture over the protein bar base and spread to the edges of the pan. Sprinkle the chopped peanuts on top and press them into the surface. Place in the freezer uncovered for 1 hour. Place a silicone baking mat on top of a jelly roll pan and line the protein bars on top. With a large spoon, ladle the melted chocolate over the protein bars. Try to encase the entire bar with chocolate. Refrigerate until rm (~1 hour). Individually wrap the protein bars in plastic sandwich baggies. Store in the refrigerator for up to 1 week or stash them in the freezer. @cynthjewel made a batch! How good do these look?? 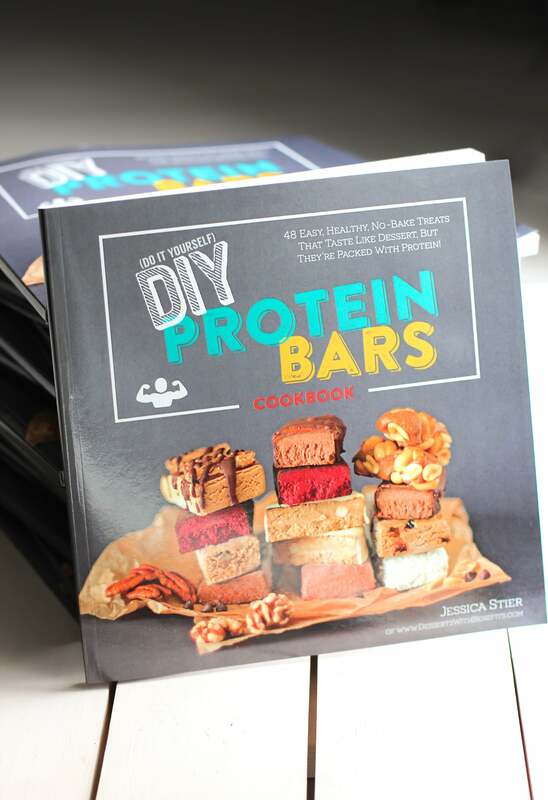 It’s been almost 2 months since I published the 3rd edition of my DIY Protein Bars Cookbook, and I am SO so happy, proud, and blessed over its success! I’ve said it before and I’ll say it again — I could NOT have published this cookbook with you guys. I wouldn’t have written it in the first place, but since so many of y’all asked me to write one, I did. Thank you to all of your for your love, support, positivity, and constant encouragement! Wishing you a great day – hugs from a Norwegian reader. Can you use vanilla whey protein instead? 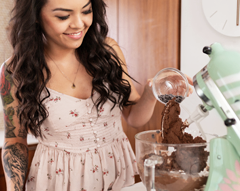 Natalie- I do not recommend whey protein powder because it has a tendency to get really gooey and sticky rather than turn into a cookie dough-like texture from the brown rice protein powder… sorry! Sneaky! Yours look prettier than the ones you buy at the store and I am sure they taste a million times better too! My husband would go crazy for these! What could I use instead of stevia extract? I prefer to use honey or maple syrup in my baking. Any ideas what I could use instead of stevia? 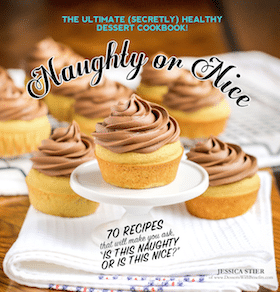 Jessica your recipes are divine! I’m (unsuccessfully) trying to wean off of processed sugar and commercial sweets and pursue a clean eating diet, but sometimes I just cannot resist! Thank you for creating so many great recipes to help the process of being more health concious! 🙂 can’t wait to try this! Now I am going to make this for my breakfast! I am bookmarking your blog! Have you considered using PB2 in your recipes? I have been thinking about converting some recipes but I don’t know what to add for the moisture since it is dehydrated….? Any ideas? THESE LOOK AMAZING! Thank you so much for this great recipe!! I’ll be making these asap! I can’t wait to try this. Thank you so much for taking the time and effort to do this. What is the shelf life if you don’t refrigerate? I wouldn’t recommend not refrigerating these because the texture gets a little too soft (still good, just really soft). The chocolate helps keep the bar sturdy and in place, but it’s just best when it’s chilled. But, if you’re camping or something where a fridge isn’t available, then I would say about 2-3 days. I recently made these and I’m in heaven! I’m battling between my desire to keep them all for myself, and my boyfriend, friends, family, and professors, who all want me to share. As soon as I made these I knew I had to have your book. I can’t wait to make them all. You’re brilliant. And I’m afraid Vega One won’t replace the brown rice protein, it absorbs too much liquid. Only brown rice protein powder works here. Hello there! I cannot have grains/wheat/whey and would like to know if any of your protein bars use a plant based protein or animal based protein before I purchase the book. Many thanks!!! Hi Leslie! 47 out of the 48 recipes in the cookbook use brown rice protein powder, and 1 uses whey protein powder. Every single recipe is gluten-free, but I use oat flour in the majority of the recipes. I would try the Cherry Pie recipe first from the book. Sounds amazing. Oh wow! They all sound delish, but I would have to try the Chocolate Covered Strawberry first. yum chubby hubby sounds good! Thank you for all the giveaways lately!! You are the best! Oh definitely Snickers! They’re my favorite! 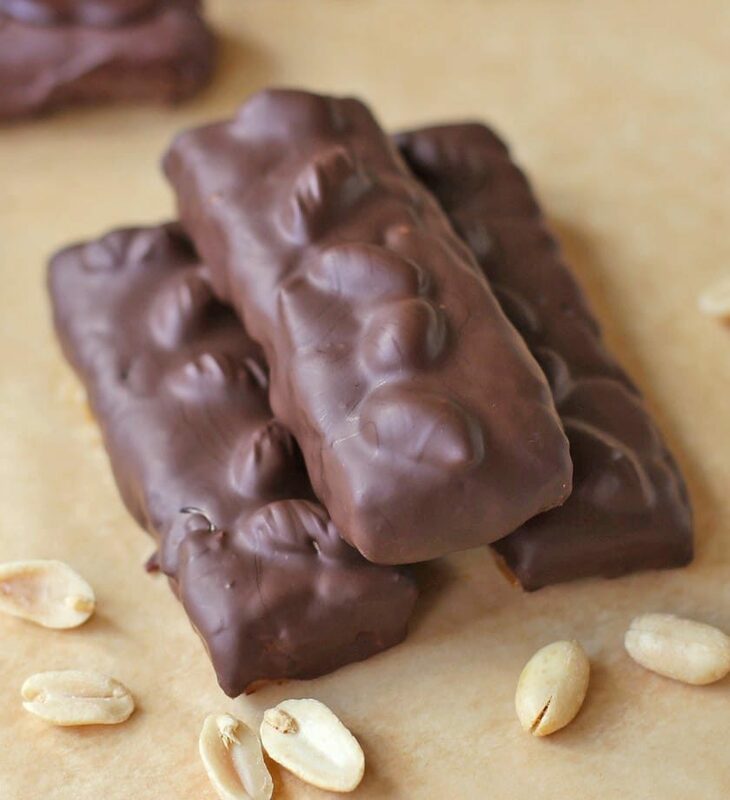 I love Snickers bars and my husband loves peanuts, so the Beefcake recipe would be first up to try. i would actually make these. they look mouthwatering good. This looks sooo amazing! Love all your recipes! The Caramel Macchiato looks great! 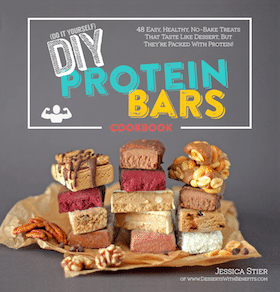 I would love to win a copy of your DIY protein bars book, It is on my wishlist at amazon just have never bought it. I also want to try Sun Warrior brown rice protein powder. I tried the Sun Warrior blend but I don’t like it. Also this protein ‘snicker’ bar recipe sounds great! I’d totally make the S’mores! YUM! These look great! Can’t wait to make them! Also want to try the recipes in your cookbook. Like the cherry pie one. Thanks for entering me in the giveaway. Looks delicious! I haven’t had cherry pie in so long (because of the nasty chemical canned cherries) and I’d love to try it!